I have 6 Active Bonuses currently running. the list only shows 3. When I click the button to advance the page, the game will lock up and freeze. Refreshing and logging in again has NO effect, the error still occurs. Clicking the "blue i" to view these 4 Active Bonuses-- now it operates correctly-- very strange. Is this happening to anyone else????? 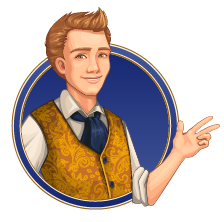 I activated powerhouse, which brought my active bonuses to 4. I was able to see them just fine. Then activated stackmaster, which brought my active bonuses to 5. Stackmaster is missing from the list... so its possible there's a problem with having more than 4 active bonuses OR there's a problem with stackmaster appearing in the list. EDIT: I spoke too soon. 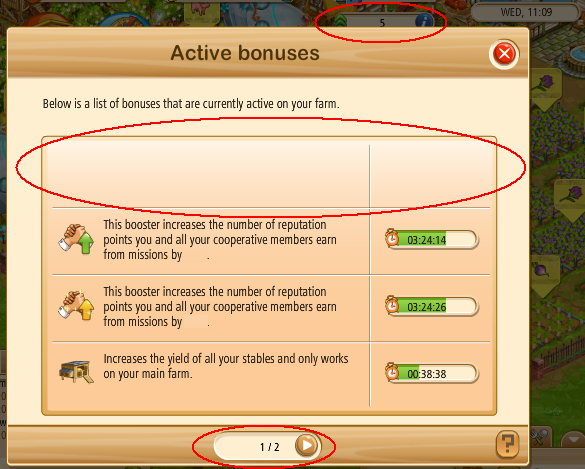 I tried to open the active bonuses menu from the gourmet farm, which currently has 4 active bonuses, and the game froze... doh! Have the same problem as above mentioned. BUT also I am kicked off the server every 10 minutes and it is really annoying. I have run ccleaner, cleared cachle but problem remains. What is wrong ??? doesn't show all boosters active - just the number. when I click to expand, screen goes dark and must reload game. hi some of us in our team are having problems the activity booster isnt working propely and the game keeps freezing . bugs no doubt, it is getting to the stage u cant play the game propely . Still happening. Had to refresh to unlock the game and lost ALL of my construction tokens. NOT HAPPY!! 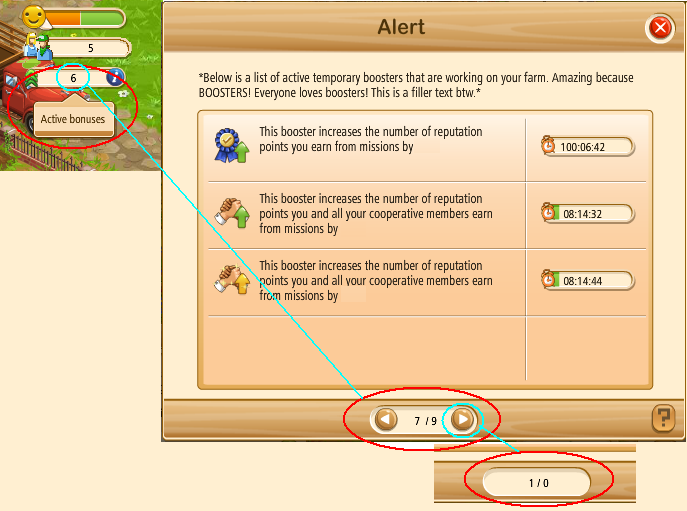 currently 4 active bonuses are running, when you add #4, the display switches to the drop down box. Open the coopcha window, go to Boosters tab and click the blue I icon. 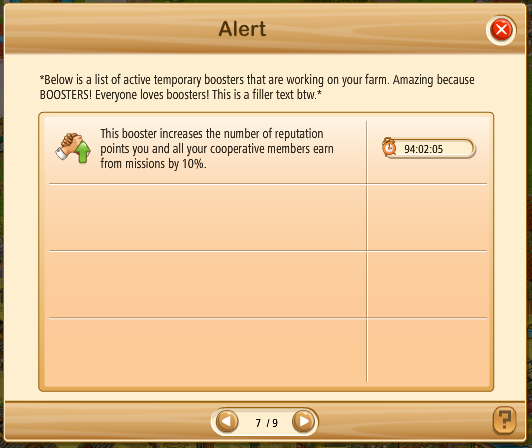 You will see a list of all the active and inactive boosters. Seems to be working fine now... 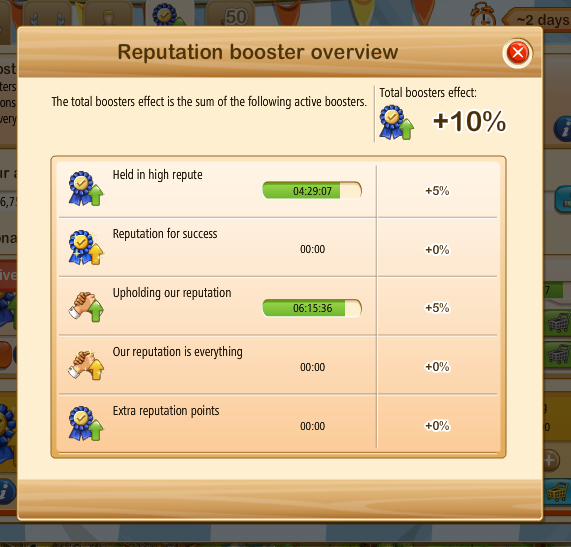 I can view stacker and powerhouse times with multiple booster-bonus on the board.. Thanks.